New ZX Spectrum games are coming thick and fast this week, as after already mentioning two previously, another one has come out to play, and it's Payndz's first attempt at writing a ZX Spectrum game in AGD, ' Cyber Mania '. 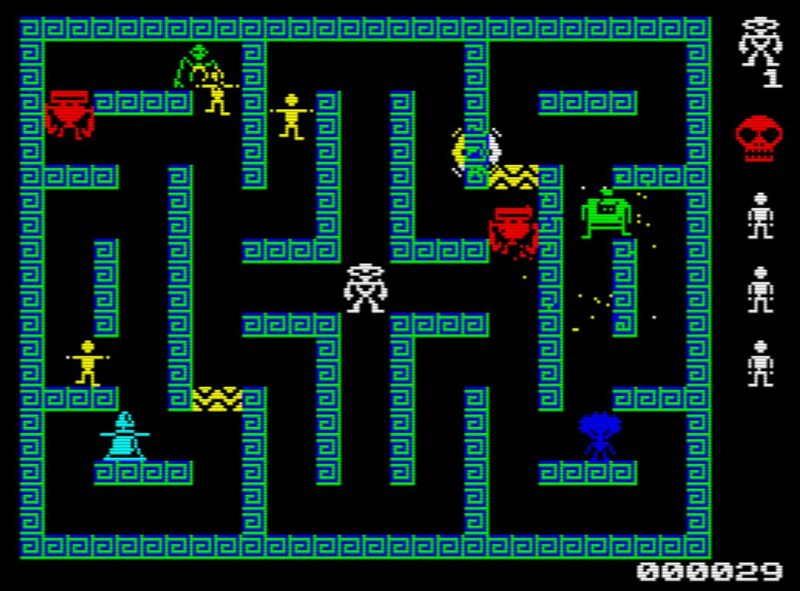 Regarded as a cross between Robotron, Berzerk and Pac-Man, you play as what looks like an alien of some kind and must rescue humans before they are killed by the increasingly dangerous robotic enemies moving at speed around the maze. Now if you've ever played Pac-Man you can generally get the gist of how you control your little white guy. Except in this game the brainless yellow humans are the ones that need to be saved, and those deadly things you see in the above screenshot must be avoided at all costs. That's unless you can save a human and get a temporary phasing shield. But be aware however some of the enemies have the power to kill a human and if that happens you wont get such a high score and the lack of just that one extra shield will make getting the rest ever more difficult. 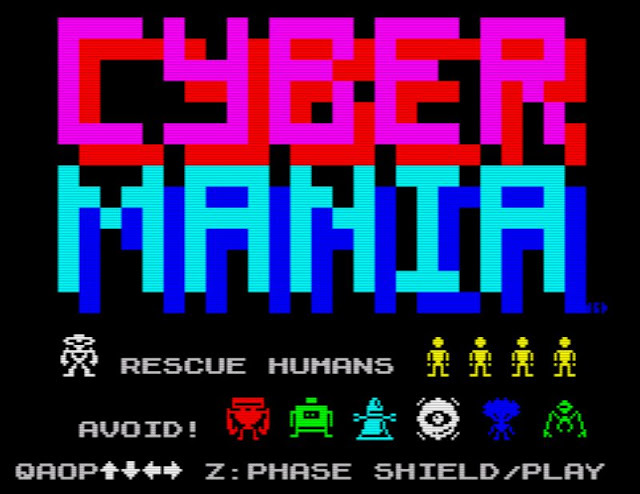 To be honest with CyberMania as a first game by Payndz it isn't half bad, but it does have a number of annoying issues that I think would need to be addressed. Firstly it isn't always easy to traverse the maze as your character can just stop if he's just that little bit further over. Take for example in the above screenshot. Imagine if I had two enemies coming at me from both sides, if I wanted to move down, but my character was just slightly to the left or right, he wouldn't be able to. Which comes on to my next annoyance, there's at times too many enemies on screen, with varying rates of movement, which if you include the character stopping is rather annoying indeed. Oh and lastly the sound effects, as there is no in game music, all you'll hear is the constant stomp of a sound throughout the game. But still saying all that, I've got to give the developer credit, it's a better game than some of the others we played, and it's still only his first AGD title!